StarCraft 2 has released a preview of changes coming soon to the Arcade — and many of them are changes players have wanted since the game’s initial launch in 2010. The majority of the previewed changes are intended to make custom games more accessible, both easier to find and easier to play. In patch 3.19, we are implementing some changes to the UI, with a particular focus on the Arcade and Custom Games experience. These changes will hopefully strengthen these already extremely active communities and provide both mod developers and players with better tools to make the most out of these features. In this blog, we’ll detail the upcoming changes, go over our main goals, and explore the benefits we think they could bring. There were many goals for the changes we are making! For the sake of this blog, we are going to focus on four specific ones. We want to consolidate the process for finding user-generated content to make it easier for you to find all the stuff you are interested in. We also give you better tools to manage that content. Our hope is that this update will provide a more flexible system for joining and creating lobbies inside StarCraft II by relying less on automated systems and giving more control to the players. There’s a ton of great custom games content buried in our current UI, behind layers of navigation and filters. We want bring that content front and center so everyone knows about it. There are currently a lot of ways to abuse the current Arcade and Custom Games systems in our client in ways that ruin the experience that other players are having. We want to minimize those opportunities as much as possible. What are the changes and how do they work towards these goals? The first major change you will notice when logging in is that the “Arcade” tab on the top navigation has turned into “Custom.” We wanted to consolidate Arcade games and custom Melee games into one place, and putting melee games under the arcade didn’t feel right, so we put both under “Custom” instead. Inside this new top-level section, you’ll find three subsections called “Lobbies,” “Melee” and “Arcade,” with the “Lobbies” section being the landing screen for the “Custom” top tab. The “Lobbies” section displays all of the current open public lobbies available across both Melee and Arcade games. The “Melee” section allows you to create new lobbies for custom Melee games. Finally, the “Arcade” section allows you to create new lobbies for Arcade games. We hope this change will help surface custom content such as open Melee game lobbies, and extension mods which are a buried a bit too deep right now in the multiplayer section. Players have been requesting “named lobbies” for years. Before we could make this happen, however, we needed to be able to display lobbies in the first place. In the old system you could not see open lobbies, only a list of maps or games that have open lobbies currently available.. This meant that if there were three lobbies open for one game, there would only be one entry in the list. When you joined that game from the “Open Games” list, it would simply put you in the oldest lobby available for that game. In this patch, you’ll now be able to see actual lobbies instead of just a list of games. Multiple lobbies can appear in the list for a single game. You’ll also be able to set a name for your lobby when you open it to the public, and even rename your lobby later if you so choose. You’ll also be able to see the lobby’s owner as well as how many slots are open right in the open lobby list. We hope this change will give players more control over which lobbies they are joining, and also help them find the lobbies that are right for them and their party. We also hope this will help prevent trolls from holding entire games hostage via their traditional methods: barring players from starting a public lobby because the oldest version is occupied by someone who just wants to keep others from playing. If you do encounter players like this, you will now be able to see they are the ones hosting a specific lobby and avoid them. And if you create your own lobby, other players will be able to see it even if a troll has already created one for that game. We have also added the ability to “Pin” a map to your sub-navigation in the Custom section. You can do this by opening the map info screen for any map and using the “Pin” button in the top right. You can pin up to three maps so you can quickly access them from the Custom section. To make pinning more worthwhile, we have also added a small “open lobbies” list in the map info screen. In this list, you’ll only see lobbies for that specific map. If you are a huge “Zealot Hockey” fan and only want to play that, you can pin it to your sub-navigation, immediately bring it up when you come to the Custom section, and see the lobbies available just for that game. We have also added a new panel to the “Lobbies” subsection which will allow you to preview a lobby before you join it. It will show you how many teams there are in the lobby, how many A.I. and players are on each team, who those players are, as well as how many open slots are open on each team. With this information, we hope players will have an easier time finding a lobby that is right for them and their party. In the “Melee” and “Arcade” subsections, you’ll find a different panel in place of the lobby preview that will allow you to quickly access your bookmarks. Clicking on one of these bookmarks will immediately bring up the map info screen for that bookmark. Much like game lobbies themselves, the Custom section now features a slightly different UI in 16×9, which makes better use of the space for those users. Lobbies will no longer autostart once they are full. There were cases before where this was beneficial, but there were many other cases where it wasn’t. Because we’re now displaying actual lobbies in the Open Lobbies list, you can always go create your own lobby if the host turns out to be AFK or neglects to start the game for whatever reason. We have removed the “Play” and “Play Again” buttons from the Arcade and Custom Games. These buttons would automatically put you into a lobby for that game, or if a lobby didn’t already exist, they would create a new public lobby with you as the host. We really don’t want to have a button that does different things based on information the user doesn’t know. For new users, this often meant confusion—they unwittingly became the host of a lobby. We want everyone to know exactly what’s happening when they click “Join Lobby” or “Create Lobby.” That said, we also realize that this change could be controversial, as there are many of you who probably use this button to find lobbies for your favorite Arcade maps, especially for maps that see a huge amount of players and activity. Please give the new system a try and give us feedback on how it works for you. On the score screen in place of the “Play Again” button, we put a “Map Info” button which will take you directly to the “Map Info” page for the map you just played where you’ll be able to view all of the currently available lobbies for that map, or create a new one. We’re not done with the Arcade and Custom Games experience. 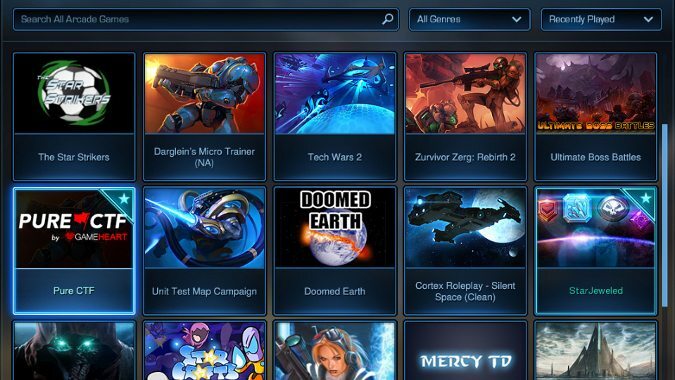 Besides being an important part of our game that sees a huge amount of engagement, it’s also especially important to many of the developers on our team who come from the StarCraft II modding community. We have more plans for the future, and while we aren’t ready to talk about those today, we hope you’ll have patience as we continue to try to build on the foundation we’re laying with patch 3.19. We’re eager to hear your feedback on these changes, so once the patch goes live, please give them a try and come back and let us know how they’re working for you. Is there more you want to see with the custom games UI specifically? Have we removed something you feel was important for the way you use the feature? Find any problems or bugs with the current implementation? These are all things we’d really like to hear! Ever since the StarCraft 2 Arcade’s introduction, one of the most common complaints among potential users was its difficulty of use. If you weren’t an active member of the modding community, finding new maps and custom game modes was nearly impossible. Considering Blizzard was toying with the idea of allowing map makers to earn money through Battle.net all the way back in 2009, it’s almost shocking these user experience changes haven’t started coming around until 2017. In this reddit thread from two years ago, the impossibility of finding maps is cited as the number one reason StarCraft 2 custom games faltered. While these changes have taken a long time to arrive, they’re still nice to see. Custom game modes are a big part of what gave Warcraft 3 its longevity, and through StarCraft custom game Aeon of Strife and Warcraft 3‘s Defense of the Ancients, an entire new game genre saw its genesis. Now that players might actually be able to find custom maps in StarCraft 2, we might start discovering the diamonds in the rough, just waiting to take off like a rocket. Little by little, StarCraft 2 is gaining the functionality of 2002’s hit game Warcraft 3.